Singapore has the fastest 4G network in the Asia-Pacific region, followed by South Korea and Australia. 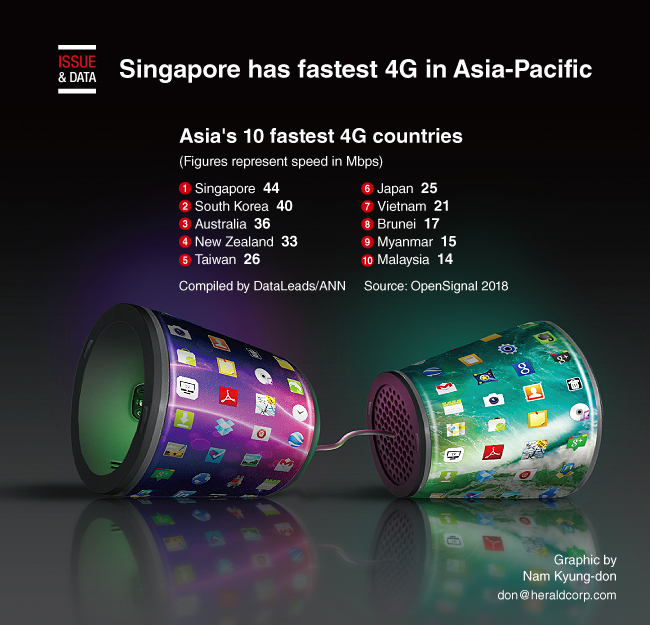 Singapore is also the fastest 4G, also known as Long Term Evolution, country in the world, according to a report by Open Signal, a UK-based wireless technology company. The report compares 4G performance across 88 countries worldwide. South Korea has the second-fastest network in Asia, followed by Australia and New Zealand. In Australia, Vodafone has jumped ahead of Telstra in the 4G speed metric, averaging downloads of 40 Mbps. According to the report, through improved smartphone technology and new spectrums, mobile operators elevated average 4G speeds first beyond 20 Mbps, then beyond 30 Mbps, and in the last two years beyond 40 Mbps. However, now the industry seems to have reached a limit to what current technology, spectral bandwidth and mobile economics can support on a nationwide level.